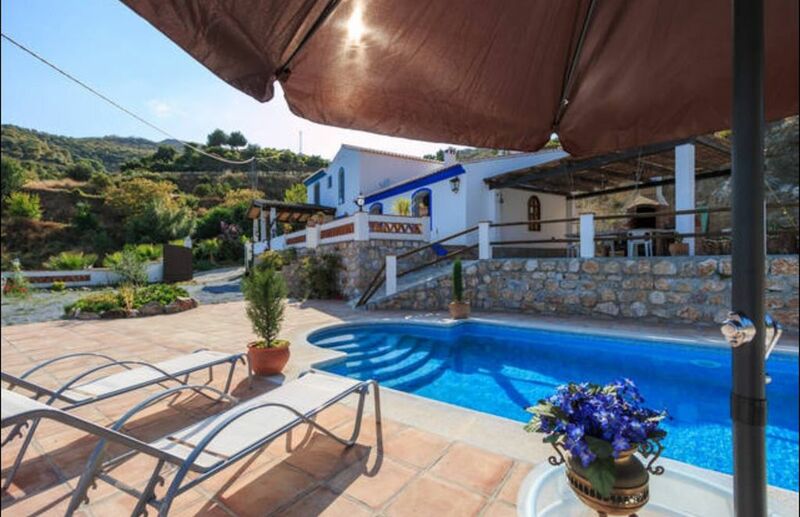 Farmhouse in idyllic setting, surrounded by nature and great views of the mountains. Composed of 2 double bedrooms, two double bedrooms, baby cot, 2 bathrooms, kitchen, lounge, pool and hammocks, barbecue, deck ,, up parking for 5 cars. Is furnished in true country style, it has a fireplace, heating, oven, dishwasher, microwave, linens, towels and all the necessary kitchenware and WIFI !! A 10 minute drive from the village and beach. Historic town surrounded by many monuments and impregnated d Phoenician culture. The town is rich in leisure, you can perform water activities like diving, wind surfing, fishing, canoeing, sailing vessels, you can also do activities like sendersimo, canyoning, paragliding and many more activities, in addition to many sites and places to visit !! we should also highlight the cuisine of Almuñecar and free delicious tapas of the bars in town !!! Ideal for a family vacation !! The house consists of two bathrooms, podmeos find one on the first floor and one on the second floor. Both bathrooms have shower, sink, toilet and one of them also has a bidet. The bathrooms include a set of towels for each tenant disinfected. We loved our stay in this cottage, or better say in a luxury villa, very much. It is situated in an amazing place, surrounded by the mountains with beautiful view. The cottage is well designed and furnished as an old Mediterranean house. It is really big, with 4 bedrooms and a huge dining-room. The cottage is very clean, with many flowers and trees in the garden. The pool is enough not only for bathing kids, but for the grown-ups to swim. The gardener keeps it clean. In the kitchen you will find everything you need for the cooking. In the court there is a good grill. Sometimes we were visited by a pretty nice little dog named Chipy and a cat. We highly appreciate the hospitality of the cottage masters, who met us to show the way and bought some food for our first day. Many thanks for our happy holidays! me ha encantado ver su hermoso comentario. habeis sido unos huespedes maravillosos y habeis dejado la casa muy cuidada y perfecta. aqui teneis casa para cuando querais regresar. loved me see your beautiful comment. You were wonderful guests and have left the house very neat and perfect. here you return home when you please. Enjoyed our stay (2 adults, 3 small children) very much! Perfect place if you seek a relaxing, quiet holiday spot for your family! Lots of outside space, less space inside, so you need nice weather to fully enjoy the facilities. Beds are not great but good enough, shower pressure is low. Also make sure the owner activated the (prepaid) WIFI connection as this was not the case during our visit and we couldn´t get it fixed. Since the remote location of the house is outside any mobile coverage you need to drive towards the city to make a phone call, check your email or send an SMS, which sometime is not very convenient. If it wasn´t for these three (minor) issues, I would have rated it 5 stars out of 5. A great place to stay! la casa es espectacular , esta muy cuidada en todo. (limpieza,utensilio de cocina y barbacoa , zona de jardin y piscina muy cuidado y limpio . los dueños son personas muy agradables . Hemos estado un grupo de 8 personas y nos ha encantado la casa y conocer esa zona. Das Haus bietet zwei Familien ausreichend Platz, ist liebevoll eingerichtet und hat einen wunderbaren Außenbereich. An dem großen Fliesentisch konnte man toll frühstücken und den Abend ausklingen lassen. Der Pool hat eine angenehme Größe und wird regelmäßig gereinigt. Der Kontakt ist super nett und bei einem Problem wird sofort reagiert! Wir haben uns dort sehr wohl gefühlt, das lag nicht zuletzt an unseren drei supersüßen Mitbewohnern (Kätzchen) auf dem Grundstück! Der Weg zum Meer und in den Ort ist nicht weit. Hemos estado en la casa dos familias. Es bastante confortable y espaciosa. La casa esta muy bien equipada y el trato con los dueños ha sido bastante bueno, son muy agradables y nos resolvieron muchas dudas. la casa dispone de wifi , algo muy necesario para mi que trabajo a través de internet. Recomiendo esta propiedad al 100%.¡ FANTASTICA! EN VERANO SOLO SE ADMITEN LLEGADAS Y SALIDAS EN SÁBADO. IN SUMMER ONLY ARRIVALS AND DEPARTURES ARE ADMITTED ON SATURDAY.